What is an RV Inverter? What does an RV Inverter do? The best RV inverter is a versatile device to have onboard your RV. It can be used for different applications. You can use it as an emergency backup power source, solar panel applications and charging your battery. It is also a special device to run your RV appliances, including television, air con and refrigerator that run on AC power. Its capacity and size, however, varies from one model to another. For this reason, it is essential to know what to look for and top picks in the category to make an informed decision. Keep reading for your guidance. One of the best inverter chargers to use in the recreational vehicle is the Power Bright PW6000-12. This model is able to convert 12-volt direct current into the standard alternating current power. With it, we can run electrical appliances and equipment on our vehicle for mobile applications. This Power Bright inverter charger is offering 29.2A, four pieces of 3-prong AC outlets and a no load draw of <.3A. It is one of the most reliable models around to rely on if you’re looking for a great AC power source for your travel trailer, camper, mobile home and marine environments. Another thing that makes it a standout among others on the market now is its durability. This device is mad with an anodized aluminum case that makes it the durable option for RV owners looking to use their inverter charger for a longer time. In addition, the Power Bright PW6000-12 comes with a LED display, which is clear and bright enough when it comes to showing data including wattages of output and input. I would also like to recommend it because it includes an integrated fan that keeps it cool. Another important feature of this unit is its overload indicator and the 30-ampere spade fuses. This unit also comes with an alarm to indicate any low voltage. It also has a smart feature that works by shutting down when it detects short circuit thermal or overload problems. 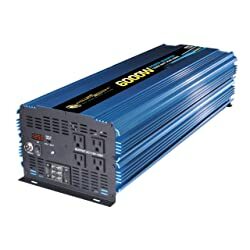 When it comes to power, the inverter charger is also one of the most reliable because it offers 12000 watts of peak power and 6000 watts of continuous power. Overall, I believe that the Power Bright PW6000 is the best inverter charger for the recreational vehicle because it has solid features and safety functions that makes it an ideal unit to have onboard for converting DC to AC power. You might want to take a second look at it. 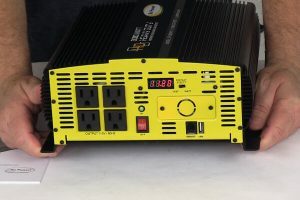 If you’re shopping around for a good power inverter charger for your RV, you should not miss but take a second look at the Go Power 3000W inverter. 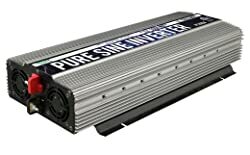 This pure sine wave inverter is an ideal choice for your RV because it is loaded with watts in just a single frame. You might want to opt for it if you’re looking for a reliable source of AC power because it can offer up to 3000 watts of continuous power, making it the top pick to supply power to your devices, even sensitive ones. There is also some readout in the unit, and they’re clear and bright, letting you be updated about the activities of the inverter charger. With this feature, you can be sure that you can monitor the current condition of your device. It is also the unit that you might want to pick if you’re planning to use it for a heavy load operation. Some of the appliances it can supply power to include stereos, TVs and PCs, among other sensitive electronics onboard your vehicle. Another thing that I would like to recommend this unit for is that it comes with several outlets, each protected by GFCI. It is also easy to look for a hardware port, which is strategically located next to the outlets. Once you also connect the source, it can protect the device from issues because it it’s designed with GP-DC-KITS. It is also the ideal choice for RV owners looking for a reliable secondary power source and one to use during emergencies. I also find it easy to set up because it comes with the accessories and mounting hardware you need to install it in your travel trailer. Finally, I love that it is backed by two years of warranty for your peace of mind. You should not miss the AIMS Power 3000 Watt on your list of choices if you want to use a reliable power inverter. It is a top choice among RV owners who find it impressive for it is a pure sine inverter charger. Many of them noted that they liked the supreme performance of the unit and its heavy-duty features and construction. I also noticed that the device is versatile to use for campers, trucks, mobile homes and marine applications. Another thing that many RVers would appreciate about the inverter is that it offers a continuous power output of up to 3000 watts, which are enough in running your appliances and even sensitive equipment onboard. Some of these can include a PCs, mobile phones and tablets. One more thing that I would like to recommend the AIMS Power is that it can deliver 9000 watts of peak performance. It is a great value for recreational vehicles and marine uses. In addition, I liked that the inverter comes with a charger, adding to its value. For its 100A smart charger, you don’t have to buy a separate one because it is also included in the purchase. Also, the best RV inverter offers up to seven settings that you can choose from and use easily. This device is the perfect choice in operating different RV tools and appliances. You can also make use of the charger when it comes to recharging the battery bank. More so, the capacity of this model makes it the top choice for devices and appliances, which require high start-up requirements, such as motors, compressors and pumps. This product also has an auto-generator start function, which adds to its value. I also appreciate that it could be used and compatible with many types of devices. Finally, you will appreciate that the unit is ideal for other applications including off-grid, mobile, backup power and solar applications. Another inverter charger that you should not miss when shopping around is the Power Tech On pure sine wave inverter. It is a high quality product that is ETL certified. It ensures your peace of mind that it meets stringent quality tests and requirements. I love that it is also powerful when it comes to converting DC power into AC power that can run many of our RV tools, accessories, gears and appliances. I would like to note that this is a versatile product that can supply AC power to refrigerator, blender and many more. With such versatility in supplying clean power to our recreational vehicle, we can be sure that we’ll enjoy camping even more. It is also suitable for plenty of applications, such as emergency power source, off-grid, marine and mobile applications. The PS1004 is an ideal choice if you’re looking for a versatile product that can be used in different environments. Another thing I liked about the unit is that it can offer 3000W of continuous power while 6000W for its surge power. You can rely on it when it comes to offering you the convenience of having power supply to run appliances and tools aboard your vehicle. When shopping around for an inverter, you should also check for the protection and safety features of the device. This model is set not only for its performance but also for its protection features. The device is built with over voltage, overload protection, thermal protection, and low voltage protection alarm and under voltage protection features. All these safety features are valuable to ensure that your devices and appliances are protected from damage. When there is a problem, there is a LED light that can indicate what it is. In addition, the unit is one of the most powerful around for offering 3000 Continuous Power and 6000W Surge power, ensuring it can supply power to your RV appliances and gears. I also liked that it can be used for marine vessels and cars. It is also good to use for failure emergencies. At the same time, this unit can offer maximum efficiency for sensitive electronics, including computers. More so, I would like to recommend Power TechON because it comes with all the accessories needed to set it up. Some of these include red and black cables, remote switch, three AC sockets, instruction manual and one USB port. The remote can work for up to 15 feet. If you’re looking for a 12V DC converter, you should not miss the Ampeak 1000W Power Inverter. It is one of the top choices among RV owners that want to make use of a durable and reliable inverter, which can supply up to 1000 watts continuous AC power output with a surge capacity reaching up to 2000 watts. It is a reliable choice for its ability in converting 12V DC into the standard 110V alternating current power. Another thing that makes the AMPEAK inverter a good value for the money is that it is versatile for outdoor or indoor use. This inverter is great to power appliances and devices, including sensitive ones like laptops and mobile tablets. It is also an ideal choice when it comes to emergency power supply during a snowstorm, hurricane, power outage and emergency situations. You will like that it can be your backup source of power. I would also like to note that the power inverter is ETL certified, ensuring it meets high quality standards for customer satisfaction. More so, the manufacturer has included an 18-month warranty on this model. You can rely on it if you’re looking for hassle-free use. Users can also have peace of mind that there is a 24hr customer support service that they can rely on whenever they need help. 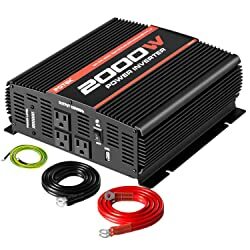 If you’re shopping around for a good power inverter for your RV, you should also consider this one because it comes with two pieces of AC outlets, which let you plug in appliances into it at the same time. I also liked that it can keep our appliances and mobile devices without any problems. A few of these include digital camera, TV, microwave oven, breast pump and cellular phones conveniently. 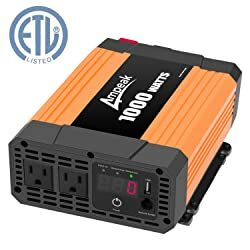 Finally, I liked that the Ampeak 1000W Power Inverter comes with advanced safety features, including overload, low voltage, over voltage, and overheat and short circuit protection. When there is an issue, the LED indicator light that will notify you of any issue. It is also a solid inverter that has electrical insulation and ABS crashworthiness. The Potek 2000W inverter is another great option if you’re trying to compare inverter chargers for your recreational vehicle. The device is the perfect solution for different applications, including off-grid, mobile, camping, marine, emergency backup power and situations, like hurricanes, snowstorms and power outages. You can rely on this unit if you’re looking for a powerful inverter that can offer up to 2000 watts of continuous AC power, while also having peak power reaching up to 4000 watts. So if you’re looking for a top performing inverter, you might also want to check out the POTEK inverter that comes with three pieces of AC outlets. They can be used to plug in three different appliances at the same time. In addition, it has a piece of USB charging port, which is ideal for mobile phones and tablets. The charging port can also be used in charging appliances, including microwaves, floodlights, RV, freezer and other appliances and electronics. With plenty of uses, the POTEK inverter is indeed a great choice. Plus, it can be used for solar power applications, adding to its value. In addition, I would like to note that the inverter is designed with safety features, including short circuit, under voltage, over current, overload, over voltage and overheat protection. All these protection features can offer you peace of mind that your appliances can prevent damage if any of those issues occur. I also liked that it comes with a cooling fan, which will start working automatically when the inverter has a temperature of more than 104 degrees Fahrenheit, ensuring it won’t overheat. More so, the device also has eight pieces of internal fuses, which make it a safer choice versus other power inverters on the market are. I also liked that the Potek 2000W inverter is ideal to use in different environments, including remote jobsites, campsites and on the road. So whenever you need AC power, you don’t have to worry because this unit can supply it for your appliances. You might also want to consider this RV inverter if you’re looking for a complete package that makes it ready to use right away upon setting up. Every purchase comes with four pieces of car battery cables, 24-month warranty and user manual. The brand is also known for its strong and friendly customer support service. 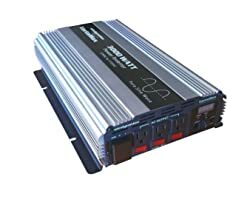 Another great choice when shopping around for a quality and durable modified sine power inverter is the AIMS Power PWRINV300012120W. It is reliable to offer top performance for its solid features and functions. It is a chosen inverter by RV owners looking for a durable product that is perfect for different applications, including mobile, marine, off-grid, solar panel applications, backup power supply, emergency power source and many more. This unit is also ideal for outdoor and indoor use. It is also an inverter that can be used in remote jobsites, campsites and other remote places. Another thing that makes the 3000-Watt Modified Sine Inverter is that it meets quality standards. This modified sine inverter is ETL listed, giving you peace of mind of buying a top-performing product. It’s also an ideal choice for those looking an inverter that comes with a direct connect alternating current terminal block and a GFCI outlet. With the AC terminal block, this device is able to supply 3000 watts to one source. I would also like to recommend the unit for its compact and durable design, yet it does not take up much space in your vehicle or work environment. This model is also dependable to power many of your devices and appliances for its ability to provide up to 3000W max continuous power. I would also like to note that the device three surge capability than other models. It also offers up to 9000-watt surge power for 20 seconds. It is also for you if you’re looking for safety features that can protect your appliances for its overload protection or over temperature protection. You can also choose the 25 watts of power save or hibernation mode. It is also a reliable choice when it comes to its thermal fan operation along with internal fuse protection features. To keep the device cool, this product is designed with an aluminum case. Finally, this product is ideal choice for boats, homes and cabins. You can also rely on it if you’re looking for an inverter that can be used for solar panel applications along with OEM type applications, which need a UL 458 listing. 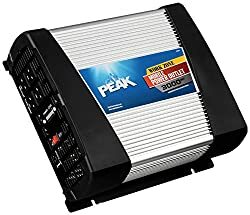 Another power inverter not to miss on this list is the PEAK 3000 Watt Mobile inverter that is perfect for your mobile home. It is also versatile for use in other applications, such as marine, off-grid, emergency power supply, backup power source and solar panel applications. This device is also ideal for campsites, jobsites and remote locations. It can supply your appliances and devices with continuous 3000 power output. You can rely on it for your laptop, blender, microwave oven and other appliances. This model is also perfect large appliances and power tools that require AC power. It is a heavy-duty power inverter that you can look forward to long-lasting use for its solid and durable components. The Peak PKC0AW is also one of the best when it comes to converting the 12V power source into household power. 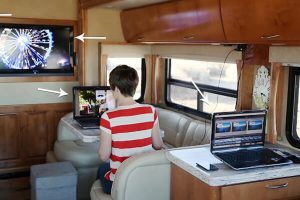 I would also like to note that it has a USB port, which lets us connect to your RV’s battery for its mounting brackets included. These brackets also make the inverter easy and quick to install. You can also rely on it if you’re looking for an ETL listed product, which ensures it meets safety and quality standards. It is guaranteed to work safely and not damage your devices and vehicles to which it supplies power. I also want to recommend the inverter because it comes with protection and safety features. For example, the device comes with an alarm and auto shutdown, ensuring protection versus issues, such as overload and over temperature protection. You can also rely on it for its alarm that informs about the battery status. I also liked that it comes with connecting cables along with a remote switch that can be used for up to 10 feet, adding to convenience of use. 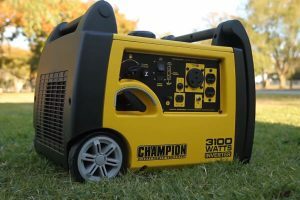 Overall, the inverter that offers 6000W surge power and 3000W continuous power is a decent choice if you’re looking for a heavy-duty inverter that can power up your appliances and tools aboard your motorhome. Aside from the top picks highlighted above, another cool choice is the KRIËGER 3000 Watt power inverter. It is one of the most versatile options around because it can be used in marine and mobile environments. It is also ideal for use in campsites and jobsites and other remote applications. You can also rely on it as a backup power source, solar panel applications, emergency power source and off-grid living. It can effectively supply power to your appliances and devices because it is top performing to convert DC into AC power, which is a standard to different appliances and tools we use in our recreational vehicle. The Modified Sine Wave Car Inverter is also the ideal choice if you’re shopping around for a complete packaged RV inverter. It already comes with a wired remote control, three feet battery cables and ANL fuse kit. 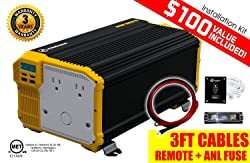 Another cool feature of the power inverter that offers 6000 watts peak power and 3000 watts continuous power is that it comes with the protection and safety features that every RV owner will need. A few of these include protection features, such as short circuit and overload protection. They will be displayed on the LCD screen, which also shows the battery level, output wattage and input voltage. This product is listed under CSA STD C22.2 and UL STD 458. It is also a high quality item that has met different standards, including those of the METLAB for its performance and safety. Another thing that you might want to take a second look at the inverter is its offer of peace of mind. This model comes with three years warranty on parts and labor. It is one of the best choices if you’re looking for power on the go and easy installation. This unit lets you connect DC battery cables into your vehicle battery quickly. This product should not be missed on this list of the best RV inverter. It is a great product from WindyNation because it is able to supply you with power on the go for your RV appliances and devices, including microwave oven, blender and laptop. You can depend on it when it comes to converting battery power into an 115V AC power. The inverter also lets you power your household appliances and office equipment from your 12V battery or your vehicle. This unit is one of the most versatile choices that you can have around for being ideal for plenty of applications. In addition, the inverter also comes with a LED display, which can easily show the power consumption (watts) and battery voltage, giving you a real time update on the status of the device. The device also comes with three pieces of grounded AC outlets, which are good for USA household devices. For protection, each outlet comes with a circuit breaker that protects the unit from damage. More so, you will like that it comes with a hardwired terminal block, allowing for permanent AC connections. This inverter can also be used in powering video game consoles, air conditioners and cellular phone chargers. I would also like to recommend the RV inverter for its one year of warranty, giving you peace of mind that there’d be help when needed. 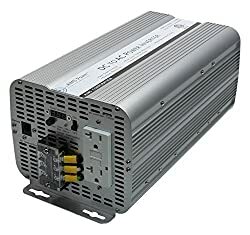 Also, this power inverter comes with safety features, including reverse polarity, thermal shutdown, low voltage shutdown, overvoltage protection along with high or low voltage alarm. Overall, the WindyNation Vertamax RV inverter is a decent choice for your recreational vehicle if you’re looking a reliable device that is made with complete efficiency and safety features. The best RV inverter is a recreational vehicle device that works to convert direct current into alternating current so that the power supply can be used in running different onboard appliances, accessories and gears aboard the RV. 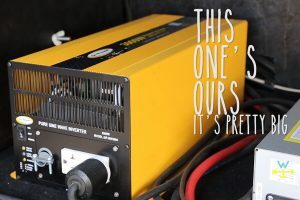 There are many types of these inverters to choose from and use on your vehicle now, and they’re in demand because they aid in operating air con, blender, microwave, laptop and other appliances in travel trailers, campers and recreational vehicles. Many of these are also used in many applications, such as emergency power supply, solar energy applications and secondary power source. They also work to protect your valuable investment because they have safety features including over voltage, under voltage and short circuit protection. Before shopping around for an inverter charger, you should also know that there are many types of them that you have to compare and consider when buying one for your recreational vehicle. A few of these include the pure sine wave inverter and the modified sine wave inverter. That is why you have to know what these are before buying one so that you can make an informed decision and get the most of your purchase. In the following, let’s talk about the types of these devices, each with unique features to compare. 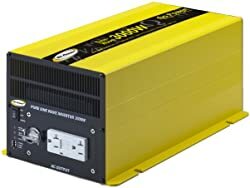 It is the costly choice of a power inverter for the recreational vehicle, camper, travel trailer and marine applications. It is chosen because it can deliver cleaner power for the RV and its appliances. The device is suitable for powering even sensitive appliances and electronics, including laptops, refrigerators and smart appliances. This RV inverter can supply quality and clean power to your appliances and other sensitive electronics, including medical equipment. It is also the versatile choice because it is suitable for all tools, equipment and appliances on the market now. Using it, you can have peace of mind that these appliances will work fully based on their specifications. It is also needed by other appliances, including battery chargers, to operate well. This inverter is the second type of the choices you have. One of its main characteristics is that it features a waveform, which suits most types of appliances and equipment. But then, you must take note that it might cause reduced efficiency in some appliances. In addition, appliances, such as fans, will consume more power when using the modified sine wave power inverter. Without even saying, this power inverter is less efficient than the pure sine wave inverter, even if more affordable. In fact, this device can consume 20% more power than the first type. Also, there are cases when the inverter is making a buzzing sound when running. Thus, it can be noisier than the pure sine wave, something to take note of if you don’t want a noisy operation. As the name suggests, compact and portable power inverters are small and lightweight. It’s ideal to bring from one place to another. So more than just in your RV, you can use the inverter inside the tent, in a remote location, construction site, jobsite, picnic or home. With such flexibility, it is among one of the most preferred inverter chargers by RV owners looking for portability. Under this type, the inverter charger can fall into one of the first types of RV inverters. It is just that this type is portable and compact in size that it is highly versatile for many applications, such as solar panels and off-grid camping. The heavy-duty inverter is one of the types of RV inverter chargers to choose from and use in your recreational vehicle, travel trailer, camper and yacht. This product is made of durable components, which can deal with the demand and heavy use. You can also be sure that it has extra durable features, such as overload, overheating and short circuit protection features. To add durability to the unit, it usually also has a built-in cooling fan that works automatically when it reaches a certain temperature to prevent damage to it. The heavy-duty inverter is also ideal for use in jobsites and remote locations when backup power source of AC power is needed. The RV inverter is one of the most essential devices to have onboard the camper, RV, travel trailer and other applications. At the very least, it works by converting DC power into standard AC power output, which is needed to run certain appliances, including air con, refrigerator, blender, microwave and TV. This function is the basic working of this device that can also protect your precious investments from damage because one can supply clean and smooth power to run your appliances. It comes with protection features, including under voltage over voltage, short circuit and overheating. With it, you can be sure that your appliances won’t be damaged. The best among them can also supply clean power even to sensitive electronics that must run to their full specifications, or else, they will be working less efficiently and consume more power. The RV inverter ensures that your appliances will operate on their total specifications. 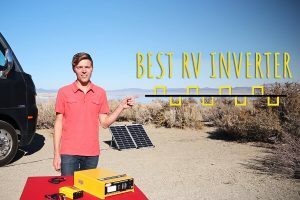 In this buying guide, I would also like to note of certain things to look into when buying an RV inverter so that you can make a better decision when choosing one. Knowing what to look for, you can be certain that you’ll get the most of the RV device. It will also help you figure out which among those choices highlighted here are suitable for your needs. A few of those RV inverter problems and factors to check out when shopping around for one are in the following. If you’re ready, let’s begin. This consideration is one of the basics when comparing choices because there are many sizes available on the market now. To help you decide, one thing to keep in mind is your purpose of using the inverter. For example, you don’t have to buy a large one if it is more than the size you need. It is the same thing with a small one. You don’t buy a too small one if it is not matching your needs. When figuring out the size you need, you should consider how you plan of using your inverter. Check their watt rating and power range. You should also determine the unit’s output capacity, which can help you pick what you need based on the loads for which you plan to use it. Thus, you must see the capacity ratings, which you can find on the continuous output and surge capacity rating. What’s the waveform output? You can select between modified sine and pure sine wave. The pure sine wave inverter is using transformers, which can make smooth and clean AC power, which is like what’s supplied in homes. However, it is more expensive than the modified sine wave inverter. But if you’re looking for a higher quality inverter, you might want to consider this power output. On the other hand, modified sine wave inverters tend to be cheaper because they make use of diodes/ thyristors in order to create a squared off wave in order to deliver an AC power form. This waveform output can also run electronics and appliances. But then, some appliances might consume more power using this waveform output. 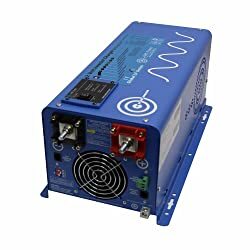 So if you’re running mostly sensitive electronics, you might want to choose the pure sine wave inverter. How many outlets are in the inverter? It is another top consideration when buying this device. Just like when choosing the right size, you must also know how many outlets you want included in the unit you’re buying. It is to make sure that you can plug in several devices at the same time. This feature will add to the convenience of use of the inverter in your motorhome. Some models may come with two or three, but you must be able to figure out how many outlets you want your unit to have for your satisfaction. The cable plugin length or material is another factor to look into when buying an inverter charger for your RV. You should look into how long the cable plugin is so that you can be sure that you can use it conveniently to reach a farther location. In addition, you should look for an inverter made of high quality materials, which can add to the durability of the device. Those built of topnotch components will tend to last longer than those made of flimsy and below standard ones do. For help, you might also want to check if the product is UL listed or ETL certified. You should also look into the protection and safety features, which differ from model to model. Check for protection features, including over voltage, under voltage, short circuit and over temperature. All these things and more can ensure that the unit will be protected from damage in the event any of these issues will occur. Choosing one with protection features can also help you achieve peace of mind that your appliances, power tools and equipment you connect to the unit will be protected from damage. Nevertheless, you should pick an inverter that is designed and built with device protection and safety features. It is easy to install the RV inverter. You can do it yourself. All you have to do is to plug it into an outlet for a cigarette lighter if you’re using a portable or small inverter. On the other hand, you have to wire the inverter directly to your RV battery if you’re using a larger unit. But for the complete guidance you need in installation, you should check the specific user manual that comes with the unit you bought. Follow the manufacturer instructions closely to ensure that you’re setting up the inverter correctly.